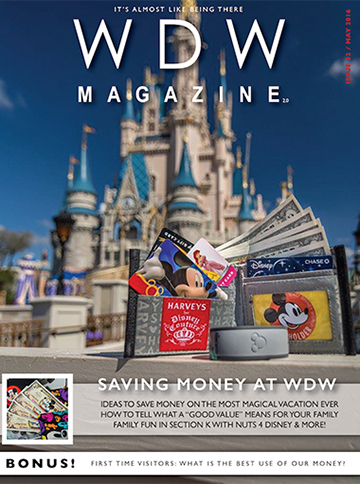 This month we are talking about Saving Money at WDW. I’ve had this issue circled on my calendar for months and it’s finally here! Boy is it worth the wait. Saving money at Walt Disney World is a big deal. Let’s face it a WDW vacation is a big investment and it’s always good to save as much as possible. So let’s see just how what we have to say about Saving Money at WDW. Saving money at Walt Disney World all starts out with Making a Budget. So that’s where we start. The we go through and look at Saving on Hotels both onsite and off. Saving on Food and Saving on Souvenirs. There are lots of good tips and ideas there. The Helping Hands section kicks off with a quick article about how much you should budget for your first trip. Then we take a good look at the difference between saving money and just being a Scrooge. Shannon tells us how a Travel Agent can save you money on your trip. Then we look at some of the really cool Free Stuff at WDW including a look at the new Lion Guard at Animal Kingdom. Our Best of WDW this month starts out by going “Under the Sea” on the attraction Under the Sea – Journey of the Little Mermaid. Next we take a trip over to our Resort of the month, the All Star Music Resort. Then we hop over to Disney Springs for a quick bite at Earl of Sandwich. Yum, yum. From Earl of Sandwich, we take the short walk over to the Marketplace Fun Finds and do some shopping. Now that’s a great lineup. Section k! kicks off with Wally D running out of room for all his Tsum Tsums. Now that’s a problem. The Parks are back with a new friend from Japan. Emily Rose and Hanna Leigh talk about Food in For the Love of Walt Disney. Lisa shows us how to have a Jungle Book Family Movie Night. Kim shares some games to play in the car on the trip and of course we have our downloadable puzzles and coloring sheets. Whew. The FanZone starts off with some interesting results from our polls this month. Then Sarah makes one of my favorite, and I’m sure most of your’s too, desserts at WDW, the Banana Bread Pudding from ‘Ohana. Pardon me while I drool for a minute. Our Vinylmation Corner looks at How to Save on Vinylmations in and out of the parks. And our photo contest winner shows a beautiful picture of Cinderella Castle. Mike Beyer shares a great story about his “Dad” and how his “Dad” shaped Mike’s love of Disney. It’s a great story about someone who “didn’t get Disney” but still was able to instill a love of Walt Disney World in his children. Cool story. I always think this section, because it is the last section gets missed. Hey, it’s the last section in the magazine, that’s where they throw all the filler stuff right? Not at all!!! This month’s Around the World is big and great. It starts out with THE NEWS and boy was there a lot of news this month. Then Jessi goes on an adventure when she does the Sorcerers of the Magic Kingdom game. Terri does a great job as always with our Fun Facts in Did You Know. She talks about how much Disney spends on… You just need to read it. Stephanie does a throw down between Mickey’s Fun Wheel at Disneyland and Characters in Flight at Disney Springs. Kim talks about some cool Disney Ticket History. And last but not least Joe takes us to the World Outside the World and visits Sea Life Aquarium in Orlando. Whew. I told you. A great issue! Take a look for yourself.